Marlee is 3-4 years old. 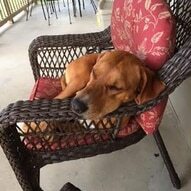 She is a Red Coonhound, possibly mixed with Cur. She is housebroken and enjoys being with her humans. She will lay with you on the chair and follow you wherever you go in the house. She seems to be submissive and loves her belly rubs. She is laid back, and very happy, sweet and friendly. She would do best being the only dog in the household, but with slow introductions can be placed in a home with other dogs so long as the other dogs are not hyper. When Marlee recently saw the vet, it was determined she may have been buck shot. An x-ray was taken of Marlee and she indeed has buck shot in her, as well as a healed broken front leg which may have been broken by a bullet. The vet is also speculating that her missing eye is actually the result of being buck shot. Through all of this abuse, Marlee maintains being submissive, friendly, sweet and loving. Marlee is looking for a home where she will be the center of attention, loved to the moon and back, and become very special in her human’s heart. Marlee has so much love to give. Can you be that human that can show Marlee how valuable she is? If interested in Marlee, please submit your adoption application. If you have any questions regarding Marlee, please email info@blinddogrescue.com. Marlee is looking for her forever home. If you think it could be yours, read more about Adopting from BDRA before submitting your application below. BDRA relies on your donations to rescue blind dogs around the United States. Please consider giving in support of Marlee.